The fascinating circumstances around the Tudor succession to the throne of England, and how it very nearly never happened. Almost everyone knows the horrific tale of Henry VIII and his six wives. Divorced, beheaded and died. Divorced, beheaded, survived. Henry Tudor may indeed be England's most famous king of all time. However, what you may not know is that the Tudor dynasty very nearly never took the throne of England. The end of the Wars of the Roses, the beginning of the House of Tudor. 22nd August 1485. England has just witnessed one of the most legendary battles ever to take place on English soil, the Battle of Bosworth Field. Having defeated his opponent, King Richard III, a 28 year old Henry Tudor stands victorious. The spoils? The Crown and Throne of England. The beginning of a new dynasty in the House of Tudor. It was hard to believe that only 24 years earlier, Edward IV had seized the English throne, all but destroying the House of Lancaster, and seemingly securing his family's right to the throne permanently. It seemed an impossibility that Henry Tudor would ever claim the English Throne as his own. So, how exactly did the Tudor dynasty emerge victorious from such overwhelming opposition? Want to learn more about the Wars of the Roses? Edward IV - A Dynasty Secured? Edward IV had it all. Peace, stability, power, sons and heirs. Seemingly, the House of York was here to stay. Rewinding two decades. Edward IV inherited his claim to the Throne of England after the death of his father, the 3rd Duke of York. Following his father's death, Edward won a series of military campaigns across England, allowing him to be proclaimed King of England in 1461. These military successes, culminated in the Battle of Towton, which Edward's Yorkist army won, virtually eliminating the rival faction, the Lancastrian forces. The next 9 years saw Edward overthrown by his cousin, the Duke of Warwick, before being restored, then deposed again, as Henry VI (of the rival faction) took his place on the Throne of England. Edward subsequently reclaimed his throne a number of months later, in the process putting an end to rebellions and uncertainty surrounding the throne as, throughout all this, the opposing faction, the Lancastrian line, had been virtually eliminated. Edward then set about securing the throne and his own dynasty. He had three sons, one of which died in infancy. The succession to the throne seemed secure, a security which he sought to protect on his deathbed in 1483 by naming his brother the protector of his successor, his eldest son, Edward (V). The stability of the Royal Family seemed to be secure. 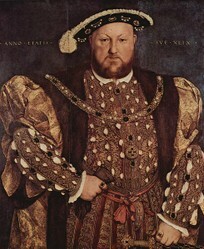 Who is your favourite Tudor Monarch? Following the death of Edward IV, Edward V was crowned King of England. Edward V was the eldest son of Edward IV. As he was underage, his reign was dominated by his uncle Richard, who was Lord Protector during Edward's adolescence. However, following his declaration as King, he, along with his younger brother, was sent to the Tower of London, under the guise of a safety precaution, making Richard King in all but name. Before long Richard deposed the young monarch and was declared Richard III of England. Shortly afterwards, both the young Edward and his younger brother Richard, both mysteriously disappeared. To this day it is uncertain what the fate of the young princes was. However, it is widely accepted they were murdered under the orders of King Richard III. This act had eliminated both heirs of Richard's older brother, Edward IV, and, with no legitimate heirs to the throne, the succession was once again called into question. A new dynasty emerged from the Wars of The Roses. The most unlikely outcome proved to be the victor. In early 1485, Henry Tudor returned from exile in France to England, supported by a force of 5,000 men. Henry knew that his only chance of claiming the throne for himself was to defeat Richard quickly, as Richard's troops would far outnumber his own. The resulting battle is viewed as one of the major battles of British history, putting the monarchy on a course which led to many modern aspects of British society. The battle resulted in a decisive victory for Henry's forces, with Richard III dead on the battlefield. Henry was now able to claim the Crown of England as his own, effectively bringing to an end the decades long Wars of the Roses. Despite the near elimination of his ancestors at the hands of the House of York, Henry had managed to ultimately overcome colossal odds, and, at the age of just 28, ascended to the Throne of England. Faced with such overwhelming odds, the tide could have gone the other way. Henry may never have taken the throne of England. Richard III may have lived the rest of his days as King, securing the Yorkists as the rightful Royal Family for future generations. The House of Tudor may never have sat upon the throne, depriving the nation of a series of legendary monarchs in Henry VIII, Edward VI, Bloody Mary I, and Elizabeth I. So easily the course of English history could have been changed, and the most influential monarchs in English history may never have existed. Yeah, it's truly fascinating. There are so many things that could have been done differently. Small things, that could have altered the course of history on so many levels! It's hard to imagine a world where Henry VIII and Elizabeth I never existed, but it so nearly happened! I love these trouser legs of history, when a parallel universe seems the more certain course. It's fascinating to think what might have happened, and who would have sat on that throne.